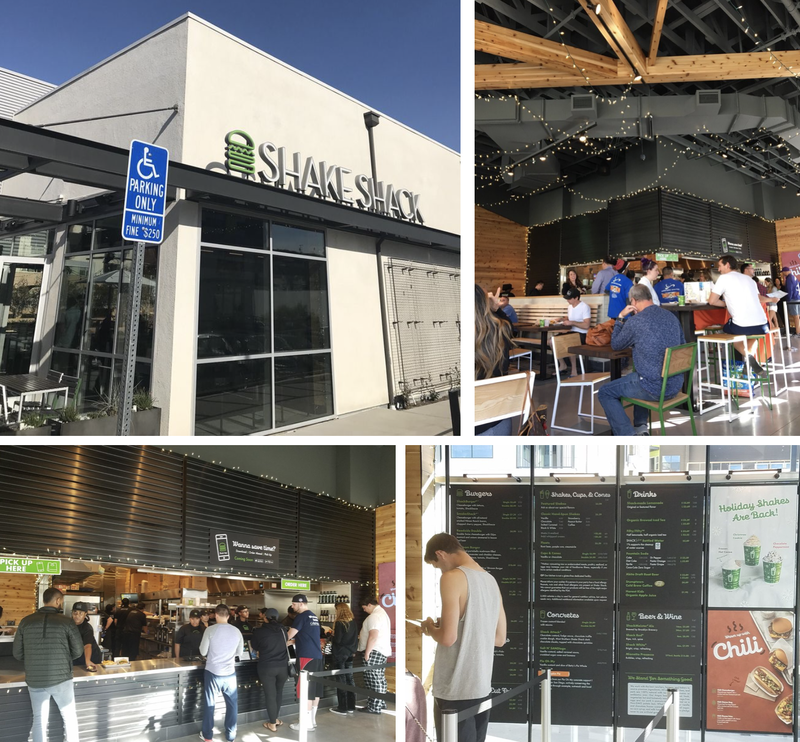 The premier San Diego Shake Shack location debuted within the renovated Westfield UTC this past October and the second location will unveil in Mission Valley this week - with more rumored to be in the works. In anticipation of the local expansion of the mega-popular fast-casual burger concept, check out Shake Shack's secret menu! The second San Diego Shake Shack opens this Thursday, December 21 at 11am in the standalone building at 675 Camino de la Reina in Mission Valley as part of The Millennium Mission Valley, a retail and residential development. The NYC-based burger company, which intends to open more area outposts in the near future, serves up a menu of 100% all-natural antibiotic & hormone free Angus beef burgers, griddled-crisp flat-top hot dogs, cage-free chicken sandwiches, fresh-made frozen custards and shakes, crinkle cut fries, as well as an array of San Diego craft beers and California wine. Like its competitor, In-N-Out Burger, Shake Shack also has a secret menu filled with goodies, but unlike I-N-O, getting the individual restaurant to prepare these specialty items is often half the battle - so be sure to be patient and ask nicely! Peanut Butter and Bacon Burger - Honor the King of Rock-n-Roll with this burger topped with bacon and Shake Shack's homemade peanut butter! Shake Shack Quad Burger - 4 patties covered in melted cheese!?! Will they build bigger? Smaller? Check and see. Shack-Cago Burger - The love child of the Shack-Cago Dog and the ShackBurger, the Shack-Cago Burger is topped with special relish, onion, cucumber, pickle, tomato, mustard, celery salt and peppers. Double Shack Stack - Double down on the Shack Stack, with this difficult-to-eat burger topped with two beef patties and two deep-fried breaded and cheese stuffed portobello mushrooms. Hatchburger - Although a misnomer as they are not hatch chiles, this item is the Shackburger with an extra zing due to the sliced chili peppers. Shandy - A known hangover remedy and golfers' delight, Shake Shack serves a cocktail of beer and lemonade by special request. Root Beer Float - Most people think that this is only available on National Root Beer Float Day, but the Shack Float can be ordered 365 days of the year. Beer Float - Yes, at Shake Shack you can order a beer with a scoop of frozen custard on top. Cheese Dog - Shake Shack will split their hot dog lengthwise, grill it, then top it with cheese sauce. You can also get it spicy by adding sport peppers or have them top it with all the Shack-Cago dog toppings. Grilled Cheese - The Shake Shack grilled cheese is made between two pieces of toasted bun. You can also ask for tomato, bacon, spicty peppers or a combination of all three! Chili Pepper-Cheese Fries - Shake Shack has chili peppers, fries and cheese, so why not combine them all? Pro tip - add bacon! Protein Style - Copying off of In-N-Out, the protein-style Shackburger substitutes the bun with a lettuce "wrap". We have dubbed this the "Del Mar burger". Cheese & Shack Sauce Fries - Get the cheese fries also topped with Shack Sauce for an Amsterdam-meets-America creation! You can also add hot peppers, onion, pickles and bacon! Corn Dog - This not-so-secret item is only available at certain locations for a limited time, so keep your eyes and ears peeled and ask to see when it will land in San Diego. Ice Cream Sandwich - A unique take on a classic dessert, Shake Shack's version tops one of their warm-and-toasty buns with your favorite frozen custard. Custard Fries - This salty and sweet combo is where it's at! Get Shake Shack's crinkle cut fries topped with the custard of your choice! Pro tip - add bacon! Shackburger with Pickles and/or Onion - An elementary-level secret menu item, Shake Shack also has thick wedge pickles and raw onion that you can use to top your burger. Extra Shack Sauce - For only fifty cents, Shake Shack will give you a small container of their Shack Sauce for whatever your heart desires! Can’t brave the lines? Shake Shack offers the Shack App, allowing guests to order Shake Shack exactly when they want it, right from their phone. With the Shack App, guests can select their food, choose an available pickup time and it will be cooked-to-order and timed to their arrival. Shake Shack currently has San Diego locations at 675 Camino de la Reina in Mission Valley and 4309 La Jolla Village Drive within Westfield UTC Mall. For more information on Shake Shack, visit shakeshack.com.